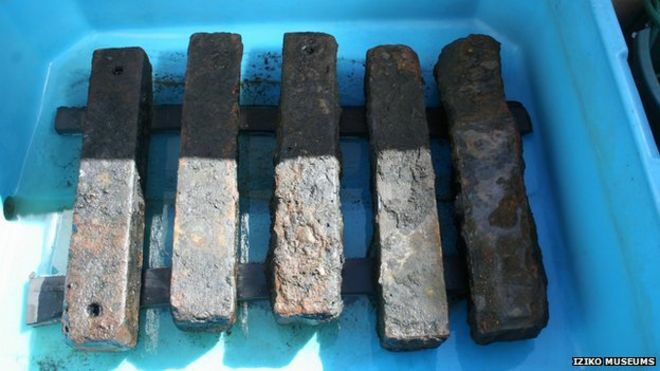 Recovered form the dive site are things such as the iron bars (pictured above) that were once used as ballast on the slave ships. All of which are set to be put on display in Cape Town South Africa. Over the course of years of slave trading, many ships went down, most of which carried slaves set to go to various countries. While the artifacts that are being unearthed are exciting and of great historical value, the real hope to come up of this will be a memorial to the men and women who were unwillingly forced into the slave trade. The trans-Atlantic slave trade carried millions of Africans to various continents and countries, many of which never made it to their destination due to poor living conditions, sickness and sometimes because of a ship going down. Cape Town’s Iziko Slave Lodge museum will have many of the artifacts that divers and archaeologists have managed to recover, including things like the iron bars that were used for ballasts in the photo above, shackles and even a wooden pulley block. Thanks to a joint South African-US team of divers and archaeologists, the Portuguese ship the Sao Jose-Paquete de Africa was discovered 100m off the coast of Cape Town. The ship went down during a storm in December of 1794. The ship was heading from Mozambique to Brazil and was carrying an estimated 400 slaves aboard the ship at the time it wrecked and researchers assume about half of those aboard drowned. It’s not certain what happened to the rest of the people on board. So far, no human remains have been found. The Sao Jose-Paquete de Africa was first discovered by treasure hunters in the 1980’s, not knowing what exactly that had stumbled upon. It wasn’t until 2010 that people realized that they had come across not just an ordinary ship but a slave ship and has been kept secrete ever since to protect it from other treasure hunters.